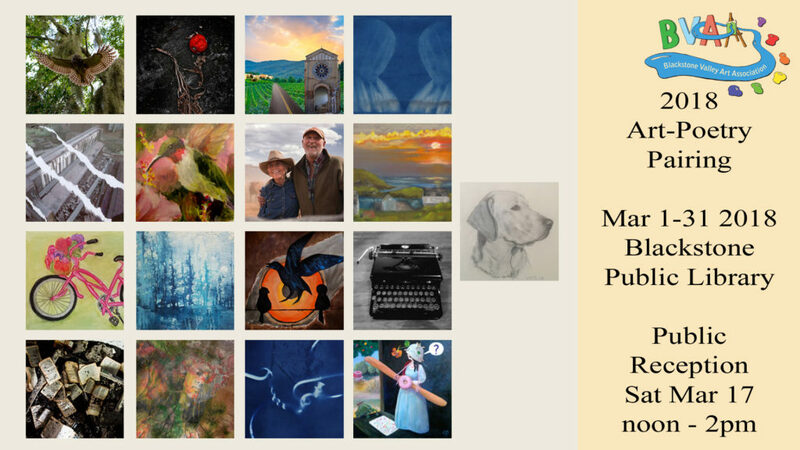 The Blackstone Valley Art Association Art and Poetry show is a creative combination of the written word and visual images. Each artist gives a poet a work of art that the poet is inspired by. The poet gives the artist a poem which the artist brings to life. Come on out to see the works and enjoy the poetry! Be sure to come out for our show’s opening reception on Saturday, March 17, 2018 from noon to 2pm. Meet the poets, chat with the artists, and learn more about this fun process! The library is fully handicapped accessible. Our display is on the ground floor. The library closes at 2pm on Saturday so plan accordingly!